Excellent property. Very quite and beautiful. It was also very clean!!! Very friendly staff. Nicely appointed clean luxury condo. Great weekend. Will definitely come back! Very clean. More of a luxury condo feel. Will definitely come back. Beautiful house and great location. Had a blast! Awesome team willing to answer any questions and made sure the house was perfect! Amazing house with a great view and great dock. Plenty of room for a big family or even a couple of familys. Matt was very accommodating and helpful. We LOVED our time at the Marlin Houzz! The pool and location right on the lake was amazing! Will definitely come back again! The property was absolutely beautiful. It was an amazing stay with the family. Well kept accommodations wonderful scenery and in close proximity to many things to do. It felt like home. Beautiful view. Booking and all information we needed before check-in and at check-out made the process simple and easy! Great place for a family vacation! It was a truly amazing experience! Matt was easy to work with as I planned our family vacation. He answered all my questions and kept me up to date with information I needed. I cannot wait to start planning our next trip to Marlin Houzz! Vacationing at the Marlin Houzz was a fantastic experience for our family. The house is beautiful, spacious, and FUN! Lots of enormous windows allowed perfect views of the patio, pool, and the lake. The kitchen was a dream and we all really enjoyed taking turns preparing meals. The size of the home and the privacy of the king size rooms made our stay comfortable and cheerful. I only wish we had planned to stay longer. The members of their team were very professional, efficient and kind. Overall, this was one of the best vacation homes we have stayed in. I would highly recommend it and look forward to booking it for a week again next spring. We spoke wit the homeowners 6 months before our stay and they were great to talk to. Weve been waiting 6 months since booking to stay at Marlin Houzz. We knew it was going to be beautiful but the photos did not begin to give justice to how truly beautiful the property is. Theres lake water on all sides and the infinity pool leading in to it was breathtaking. The dining room looks over all of that and has more than enough intimate seating. Theres a separate in law and a master bedroom thats to die for. The kitchen has too end appliances and is inviting and gorgeous. Part of the lake is in the front and in the back. The pool was too cold for our stay but some of us enjoyed venturing in anyway. The staircase is magnificent and led to many photos. The TVs and fireplaces worked well. We couldnt have done it without the elevator so that was perfect. There were turtles in the water and a new gorgeous boat dock wit strong beautiful wood. The ceilings were so high! There are neighbors but it feels perfectly private. A grocery store 7 mins away was super helpful. The bedding and beds were luxurious. We didnt use the master bathtub but it was magnificent. The artwork, long hallways and numerous gathering spots were fabulous. The whole property had us all relaxed and happy the entire stay. We will definitely be coming back! Matt and the Bluesky staff are amazing. They quickly accommodated our needs with courtesy and professionalism. 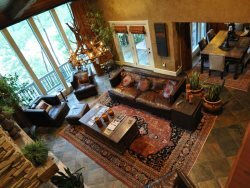 Marlin Houzz is an impressive property that is well maintained with beautiful views of Lake Hamilton. Our family of 22 had more than enough room and thoroughly enjoyed our stay. The property was ideal. The River Bend Lodge has such a beautiful view of the lake and surrounding area. The lodge is decorated in a very warm, rich motif. Felt very homey and cozy. Furniture was very comfortable. We would love to live in this lake lodge!!! We will be back!! All good -thanks -for the late check out --the hr extra made our stay that much nicer.